One way to measure the friction on a rotating machine such as an engine or motor is to spin it up and record the appropriate data while it slows down without power. By measuring the time elapsed between two RPM measurements and knowing the moment of inertia, you can compute the lost energy from the flywheel and the frictional work. I am applying this method to a Stirling engine I’m developing. Currently the Stirling-cycle engine is producing about one inch-pound of net work per revolution. My Excel-based simulation showed a gross output of 4 to 12 inch-lbs of work per revolution depending on the temperature differential and RPM. The rest of the work is either being lost to friction or my simulation is overly optimistic. 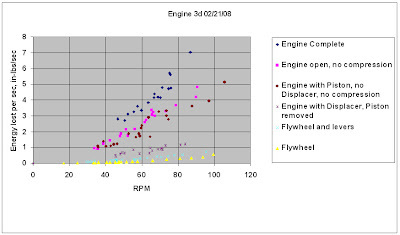 I’m using the flywheel spin-down method to measure the engine’s frictional losses and track down the distribution among the various parts of the engine. If possible use a flywheel with plenty of inertia so it will spin down slowly. Set up the configuration to test. I’ll start with only the flywheel and crankshaft, then add various components—piston without compression, displacer, etc. With a tachometer (such as the low-cost tachometer) and stopwatch ready, spin up the flywheel to a suitable RPM, note RPM1, start the stopwatch, let the flywheel spin down to a lower RPM, stop the stopwatch and record RPM2. Make a series of runs over RPM values appropriate for your setup. Use a spreadsheet to compute the energy lost based on the change from RPM1 to RPM2 and the flywheel inertia. Compute the energy lost per unit time (work) versus average RPM. My flywheel is built from 3 components as you can see in the photo. The basic flywheel is an 11.9 inch diameter by 3/16 inch thick aluminum disk. Because I needed more inertia, I added a plywood club to the flywheel. The club supports two ¾ inch bolts with 8 washers each to add mass on an 18 inch diameter. Idisk=mR2/2 moment of inertia. For a conventional flywheel the center hub might be modeled as disk. Rave= average Radius of a concentrated mass. The concentrated mass could be the two bolts shown in the photo of my flywheel, or it could be the rim on a conventional flywheel. Rave is measured in ft.
m = mass, Weight-lb/g. This is the total mass of the rim, or in my case, the total mass of the two bolts and washers. In this case I can treat the club as a spoke with an inner radius of zero. The total weight of the club takes care of the two sides of the club. This equation assumes the spoke has a uniform mass distribution along its length. If you’ve used the units I’ve suggested the result of ΔKE will be in ft-lbs of work. I usually multiply this by 12 to work in in-lbs for my engine. For a first test configuration I used just the flywheel and crankshaft. This should give you the minimum amount of friction and the plenty of time to measure the RPM and spin-down. For RPM measurements the bicycle speedometer gives accurate measurements, especially if you can use four equally-spaced magnets to give you direct RPM readout. It’s important that the magnets be equally spaced or you’ll have varying RPM measurements. The bicycle speedometer I used updates at exactly one second intervals so I use the stopwatch to count out the seconds, starting and stopping the stopwatch when the speedometer reading changes. I don’t use the actual stopwatch reading but the closest second reading—because that’s when the speedometer made the measurement. So 18.13 seconds I record as 18 seconds. 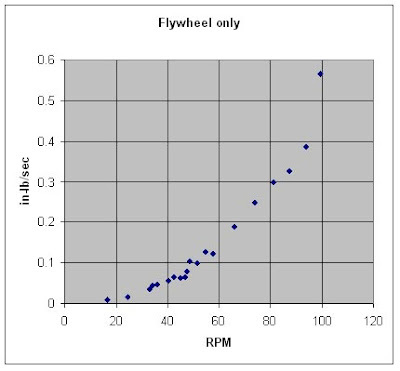 Even with accurately spaced magnets the RPM measurements may vary if the rotating mass isn’t near perfectly balanced (does your flywheel always seek the same rest position)? This is one of the sources of variation in the measurements and why you’ll want to take a series of measurements. This plot is for my flywheel and crankshaft with nothing else attached. So at 60 rpm the total friction from bearings and air friction is about .15 in-lbs/sec. The data is relatively clean for the flywheel configuration but gets fairly noise for the more complete configurations. Running the data through a least-squares curve fit provides equations that are useful for analytical work. The generated curves are shown with the data. The engine open configuration with no compression includes all the frictional sources except compression and a small amount of air friction on the displacer moving back and forth. At 60 rpm the work lost is about 2.6 in-lbs/sec. The engine has to generate approximately that much power just to turn unloaded at 60 rpm. 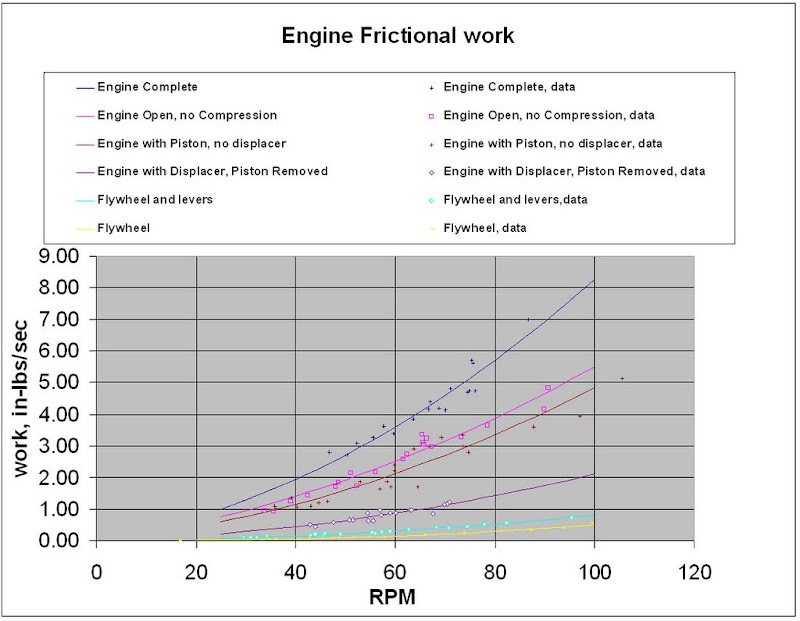 These plots give me a very good idea of the frictional losses in the engine. I still need to account for some missing work. One possibility is compression leakage around the piston and around the displacer shaft seal. I’ll look into those in the future. I have provided a spreadsheet you can use that will perform the moment of inertia computations from your flywheel measurements. It also provides a table for entering your RPM and timing measurements to generate the energy lost table and plot the results. If you don’t have Excel here is a version for Google’s free spreadsheet that you can use for your computations and plotting. You’ll need to save this spreadsheet as your own before you can use it.